Last year we didn’t really embrace the holiday period as our belongings didn’t arrive until the 23rd, and we could only feel so much festiveness while living in a rented apartment. Sad times. Poor show. And this year? Well I have been slacking. Slacking in that I have done very little thus far to prepare. Hardly any presents have been bought. No gifts have been made. The reason being that I have been working hard, hosting back to back visitors from England for the past couple of months (which has been awesome), and of course forcing myself to finish off my Physics class – that deadline is looming! 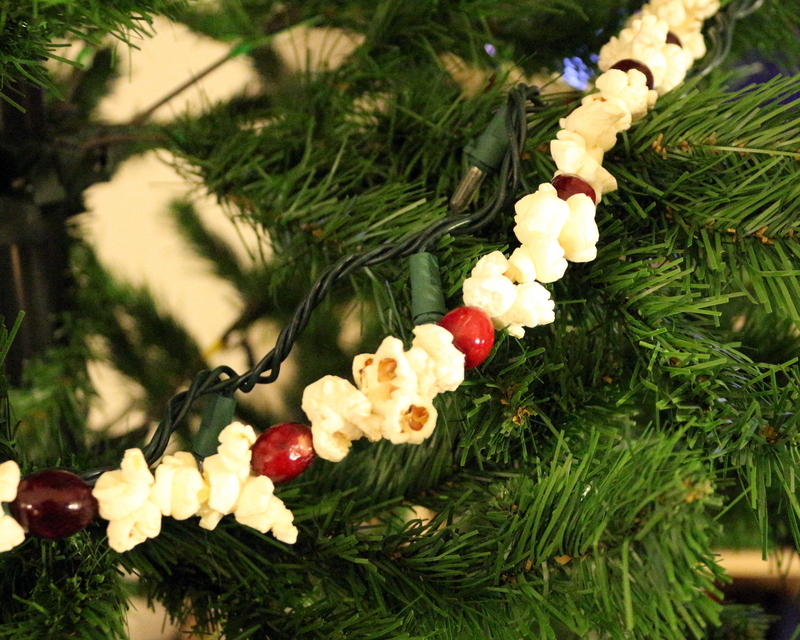 I first saw a popcorn/cranberry combo garland on MarthaStewart.com a couple of years ago, didn’t get round to it, so this morning as I was feeling virtuous after completing a module of my physics class, I decided to indulge myself in a little bit of quick crafting and make some decor for the tree! Anyhow, I very much recommend looking at the helpful hints in this post, which will save you lots of time and effort. Having done so, once we got back from San Diego last night, I popped to the shop, came home, popped a load of popcorn (making the whole place reek like a cinema) and left it to go nice and firm and stale ready for stringing up today! I also used only the firmest cranberries from the bag, so still have some left to make something tasty! 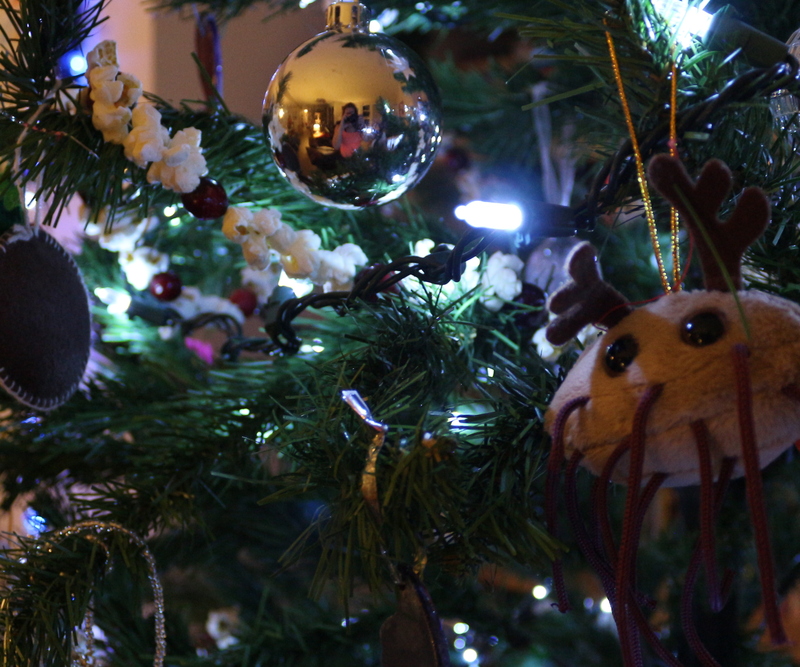 Now our tree looks like Christmas has thrown up all over it…..
….just how I like it! Eek! I have yet to do mine, but it should be this weekend! 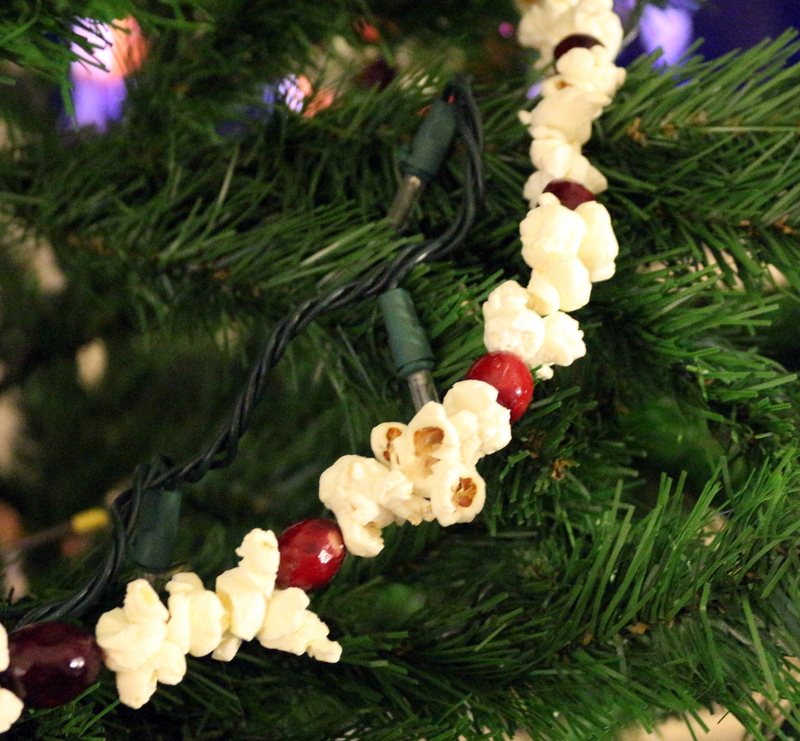 I had never strung popcorn before, but it was a nice little activity while watching Christmas movies! Looks pretty! I got some Christmas presents wrapped this week – and that’s about it. Have fun getting in the holiday spirit! I am somewhat behind, I haven’t even made a Christmas cake yet this year! Umm, is that a Reindeer/Spider genetic cross you have as a Christmas dec there? It is clearly an E. coli disguised/ dressed up as a Reindeer!